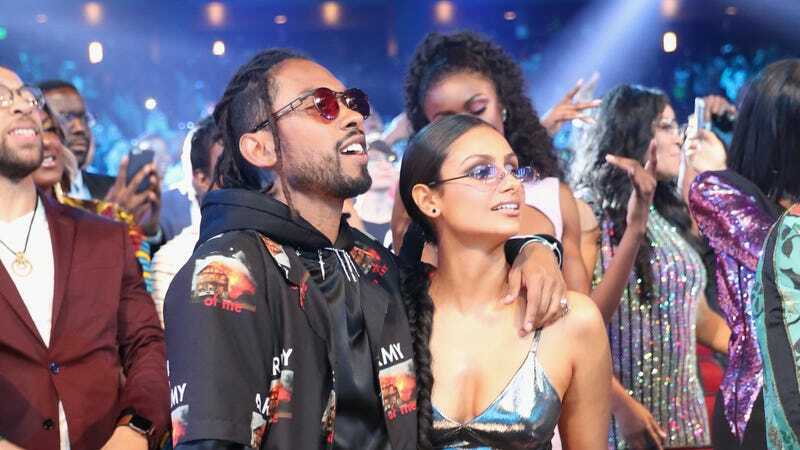 I would like to think I couldn’t care less about Miguel’s personal life, but after engaging with every link and Instagram post related to the wedding ceremony of his and longtime girlfriend Nazanin Mandi, I’ve come to the conclusion that I care a lot. Because Miguel is extra—and Mandi waited over a decade for this day—they of course took the wedding to the next level. The two tied the knot on November 24, with pineapple California skies as their backdrop at the Hummingbird Nest Ranch. The venue, which sits on the Santa Susana Mountains, made for some gorgeous photographs. By photo 24 of 44 on Vogue’s slideshow, which shows Miguel crying while looking at his now wife walking down the glossy black aisle, I was done. Mandi had three distinct looks throughout the night: a lace, fitted dress avec trail and Spanish-style mantilla to walk down the aisle; an angel arms white jumpsuit; and a silk gown for the reception. The two have been together for 13 years and met when Miguel was relatively unknown and Mandi was interviewing him. Among the many details of note are: the tiny glasses Miguel wore for part of it (see above), the coconut cake (which was almost a tres leches), the burgundy flowers that lined the aisle, and Mandi’s bridal robe, which I’d like to wear in my home for those nights when I want to feel fancy while pouring cereal. As their post-dinner evening topper, the couple rudely had In-N-Out, the heaven-sent burger spot I’ve been craving for the past two weeks. The main dish was traditional Mexican food, with an endless flow of tequila. That alone would’ve made the wedding a success.